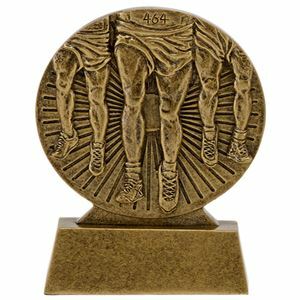 At Impact Trophies & Medals, we offer a huge range of marathon trophies, medals and awards suited to any marathon event or competition. 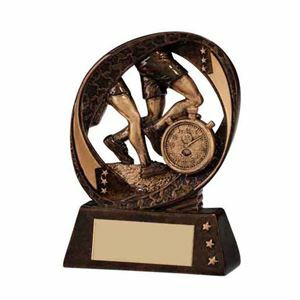 Our extensive range includes runners trophies, marathon awards and shield trophies for marathons and half marathons. Impact Trophies & Medals are a leading retailer of marathon trophies & awards. Great for personalisation, many of our marathon runner trophies and glass awards for marathon runners can be personalised with high quality text engraving and printed logo inserts, to perfectly meet all your marathon presentation needs. 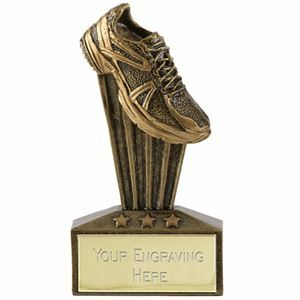 The Micro Running Shoe Trophy is a small resin trophy coated in a high shine glaze. At the top of the trophy there is an angled running shoe, complete with stitching and lace details, in two tone gold. The Mini Star Running Trophy is made from gold coloured resin coated for a high shine finish. The star shaped frame features two pairs of legs wearing trainers in a running design. The feet sit above a star banner. 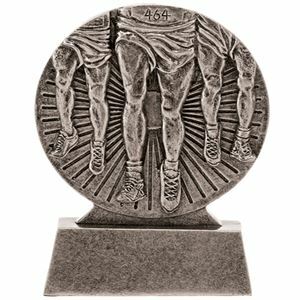 Available in gold, silver and bronze, the Flow Running Award is a small medal style trophy displaying 3 runners legs. The Flow Running Award is made from high quality resin and stands on a small rectangular base. The Athletics Mini Cup Award is a high quality resin trophy at an affordable price. 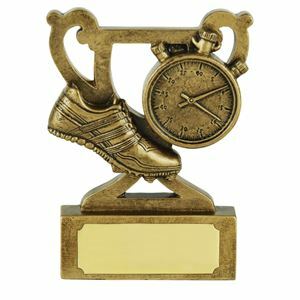 Cast from premium resin and finished in a glossy antique gold, this trophy features a running shoe with groove detail and a stopwatch also embossed with fine detail. The award is mounted on a small base which can be personalised and is supplied in a black picture box. 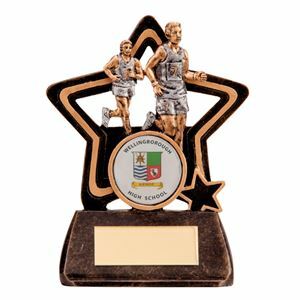 The Shield Star Running Award is a high quality resin trophy coated in a high shine lacquer. 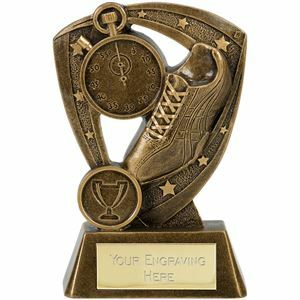 The shield shaped trophy, with etched star details, contains 3 sets of runners legs with sock and shoe detailing. The Shield Star Running Trophy stands upon a customisable rectangular base. Set within a star shaped frame are 3 sets of runners legs, running from left to right. 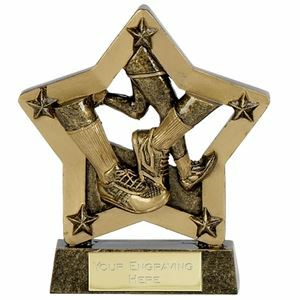 The Star Running Award is a small star shaped trophy made from high quality resin with a lacquered finish. The Star Running Award is set upon a rectangular trophy base. 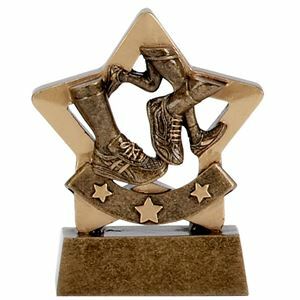 Cast in fine silver and gold detailing, the Little Star Running Award displays two runners framed by a gold and bronze star and stands on a small bronze rectangular plinth. The trophy is made from a premium resin and is burnished with a lacquer for a high gloss finish. Set upon a slim trapezium shaped base stands an antique gold resin frame holding the image of a running shoe and stopwatch. The triangular frame is finished with curved sides and is embossed with decorative stars. The Puma Athletics Trophy has space on its base, designed for you to add a personal touch. This trophy offers excellent value for money. Set on a small rectangular plinth, the Typhoon Running Trophy displays, in intricate detail, two runners legs and a stopwatch encircled by a band decorated with embossed stars and ribbon. Made from a high grade resin, the trophy is highlighted in gold and finished with a high quality varnish for a glossy sheen. 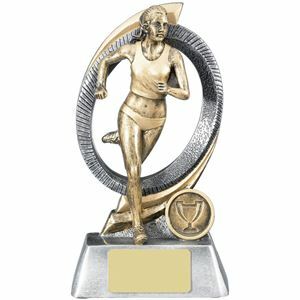 Framed by a sweeping hoop of pewter, this stylish Halo Female Running Trophy showcases a golden female figure, posed in a running position and dressed in running kit. Mounted on a trapezoid shaped plinth, the trophy is made from resin and comes in a choice of 3 sizes with personalisation options. The hoop is finished with grooved lines and golden swooshes, giving the impression of energy and movement. Produced from a high quality glazed resin, this stunning trophy features a golden male running figure at its centre. Presented on a trapezoid shaped base, this Halo Male Running Trophy is framed by a pewter circle and decorated with sweeping golden arcs and ridged lines. The running figure is cast with excellent attention to detail with the runners clothes and face featuring realistic markings. The trophy comes in a choice of 2 sizes with the option to personalise to create a bespoke award. The Conqueror Male Running Trophy has been cast from a quality resin and glazed with an antique gold lacquer to provide a burnished sheen. 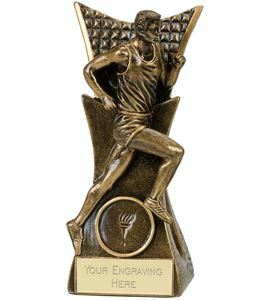 The trophy depicts the image of a male running figure wearing running kit, set against an embossed curved plaque. 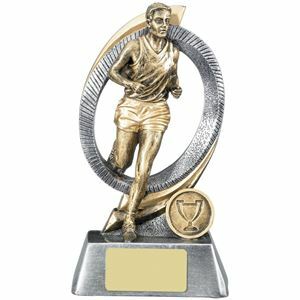 This attractive trophy would be ideal for a number of running events and can be personalised to create a bespoke award.